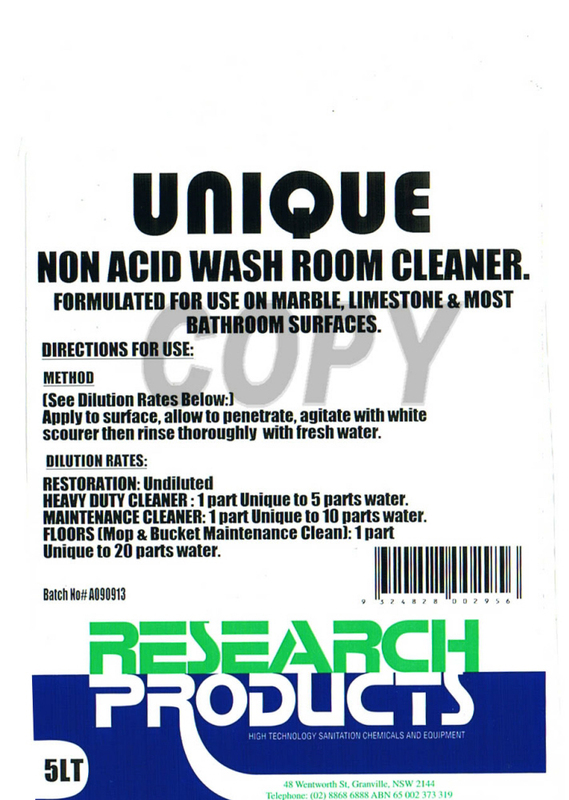 Specialised non-acid cleaner formulated for use on Marble, Granite, Stone bathroom surfaces. It is also suitable for most other bathroom surfaces, including glass. This non-acid washroom cleaner is developed for the removal of calcium haze, lime and soap scum, specific applications include complete heavy duty surface cleaning, floor cleaning and spot cleaning. It can also be used with a white, non-scratch scourer to restore and revive surfaces. Available in 750ml Trigger, and 5L. Apply undiluted to surface. Agitate using a white scourer in a circular motion. Allow to penetrate the surface for approx. 5 minutes. Thoroughly rinse with fresh water. Dilute 1 part UNIQUE to 5 parts water. Apply to surface and allow to penetrate for approx. 5 minutes. Thoroughly rinse with fresh water. Dilute 1 part UNIQUE to 10 parts water. Spray or wipe over surface. Allow to penetrate for approx. 5 minutes and rinse with fresh water. For maintenance cleaning of floors, dilute 1 part UNIQUE to 20 parts water. Mop over entire surface. Rinse with fresh water. Do not dilute. Apply directly on to the surface. Agitate with a white scourer in a circular motion. Allow to penetrate for approx. 5 minutes and then rinse with fresh water.